The Confederation for British Industry and other employers’ organisations raised the alarm about the potential for economic mayhem under a Jeremy Corbyn-led government after proposals for the biggest nationalisation drive in the country’s history were unveiled at the Labour conference yesterday. John McDonnell told the gathering in Liverpool of his “radical” ambitions for seizing control of Royal Mail, the railways and the water and energy and energy industries. “It’s time to shift the balance of power in our country,” the shadow chancellor said. Low-tax campaigners said his hard-Left blueprint would mean “abject misery for families and businesses” while the Tories calculated his proposals could cost households more than £2,000 a year in higher utility bills. Business groups warned the “ideological” plan would scare off investors and lead to a “double whammy” on savings and pensions due to a collapse in share values. Mr McDonnell set out his 1970s-style socialist plan to transform the economy in a five-year term in office in his keynote speech to the Labour conference. He claimed the party was “ready” for a general election and to implement a “radical” economic programme. “At the heart of our programme is the greatest extension of economic democratic rights that this country has ever seen,” he said. Mr McDonnell promised measures to force large companies to give a third of seats on company boards to employees and pay profit dividends to staff. Labour’s plans would be far more radical than the nationalisations of the 1960s and 1970s because they would put workers and local councils in charge of public services, the shadow chancellor claimed. Vowing to take the water industry back under state control, he promised “a new publicly-owned water system that puts this essential service back in the hands of local councils, workers and customers”. Details of the plans for the industry showed that staff would keep their jobs “except for senior executives and directors, whose posts will be re-advertised on dramatically reduced salaries capped by our 20:1 pay ratio policy”. Shareholders would be compensated by being given “bonds” at a value decreed by Parliament, the plans added. Mr McDonnell pointed out to the conference that this year marked the 100th anniversary of Labour adopting the Clause Four pledge “to secure for the workers, by hand and brain, the full fruits of their Labour” that was discarded under Tony Blair’s leadership. Confederation for British Industry director-general Carolyn Fairbairn led the chorus of concern about the plans from business leaders yesterday. She said: “With Labour’s current proposals, the fallout for the UK, its workers and customers would be a drop in living standards. “From renationalisation to dilution of shares, Labour seems determined to impose rules that display a wilful misunderstanding of business. “Their policies would immediately reduce the value of shares owned by ordinary people by over 10% and hobble UK ambitions to compete on a global stage. That’s a double whammy for people’s pensions and savings. He added: “The call for wholesale nationalisation could put investment in a deep freeze at precisely the time we want to be encouraging investment in the economy. Analysis by the Tories, based on the economic effect of an energy nationalisation programme in Germany, estimated that average household utility bills would rise by £200 a month. Chancellor Philip Hammond said: “John McDonnell showed yet again that Labour don’t know how to handle the economy and have no idea what their plans would cost. 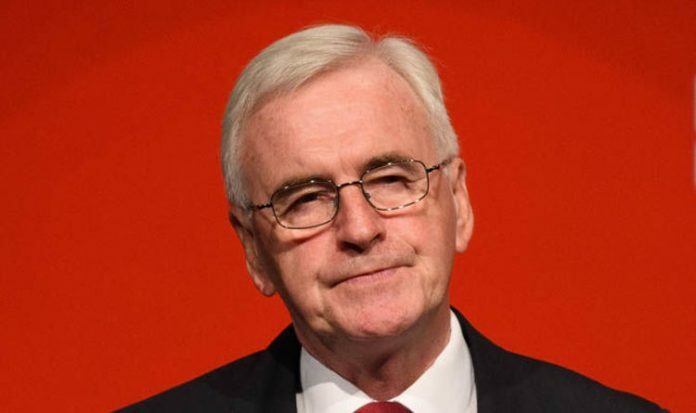 John O’Connell, chief executive of the TaxPayers’ Alliance pressure group, said: “John McDonnell’s plans for higher taxes and more public ownership would mean abject misery for families and businesses. “Taxes are already at their highest level in nearly half a century, and even more punishment taxes will actually mean less cash for public services. “The dangerous policy of seizing control of industry by the back door and nationalising everything they can get away with is a sure-fire way to scare off exactly the investment that Brexit Britain will need to thrive. “Instead of hurting the poorest by undermining public services and damaging the businesses that employ them, McDonnell should embrace policies that will grow the economy by trusting individuals and entrepreneurs to spend their money better than any politician ever could.